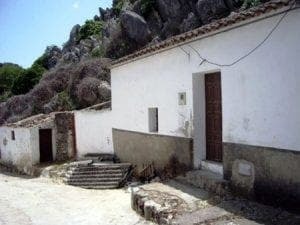 2003: Our Spanish village house cost 80.000€, plus 40.000€ for renovations. 2005: A townhouse was selling for 170.000€. Ours was valued at 190.000€. “Have you got another one?” we asked. 2010: We now own two village houses. ‘Recession’ should be a four-letter word; will we ever profit from our investments? After the renovations at Casa Alta, our project manager, Cristobal, told us that the new-built townhouses at the bottom of the village were selling for 170.000€. “Más o menos 190.000€,” said Cristobal. Wow! We had realised a profit of about 70.000€, with virtually no effort on our part. “Have you got another one we can renovate?” we asked. Within a few days, Cristobal showed us several houses in Montejaque that were priced to sell, and could be done up to turn a profit. Our favourite was the one we called ‘the donkey house’. It had a 22-metre frontage that sloped downhill, comprising a small (two-room, single-storey) cottage with attached goat-shed and donkey-house, and a pig-shed behind. It was built up against the mountain; and, although at the bottom of the village, the views were still terrific. The price was even more so – a steal at 40.000€ … including the furniture (of course). From February to August 2006, I lived at Casa Alta, having decided I was going to knock down the goat-, donkey- and pig-sheds at ‘La Otra Casa’ by myself. (I had visions of looking like a bronzed Demi Moore after swinging a sledgehammer and chucking boulders for several weeks). Daughter Katie accompanied me (her gap year), and our first project was to clear out all the hideous furniture left behind, and to take down the fences and roof (made up of barbed wire, old iron headboards and bedsprings) in the goat shed. A friend removed the asbestos roof from the pig-shed. When husband Kevin came to visit at Easter, we took off and stored the roof tiles from the donkey-house (those old Spanish tiles sell for three Euros each, and we planned to use them when we re-built). The original three-room living accommodation – a small entrance hall with a chair, table and fridge, a double bedroom, a bathroom and a hotplate (yes, the toilet was in the same area as the ‘kitchen’) – was structurally sound. We were glad we didn’t have to knock it down, and could build off the 25cm thick outside walls and the lovely tiled roof. Our idea was to take out the internal walls, with the original house becoming a dining room/living room. Where the pig-shed was located, at the back under the mountain, would be the kitchen. The goat-shed would be an entrance hall, and the donkey-shed a master bedroom with en suite. We planned to put a second storey on this part, with two small bedrooms and a bathroom upstairs. The architect, Rafael, climbed all over the property, taking measurements and shaking his head, thinking our suggestions wouldn’t work. “That would mean most of the rooms will have to be on different levels, with two or three steps up or down to them throughout the house,” he said. We told him we expected that – simply because we were building back into a mountain with rocks we couldn’t move. In fact, we thought the rocks might even become a feature in some of the rooms, particularly the entrance hall. Rafael then became enthusiastic with the ideas, and came up with a design that pleased us both. 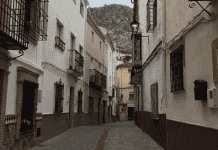 The plans had to be approved by the Town of Montejaque, and then were sent to Malaga to be signed off. The house officially became ours in mid-May 2006, which is when we started on the destruction of the out-buildings. Son Matthew joined us from Canada, after his first year at university, and he did most of the sledge-hammer swinging, loosening the walls, while Katie and I picked up and chucked rocks. Most of the walls were about 30 cm thick, made up of boulders cemented together. Every few days, Angel Boyle (the dumper man) would come down with his dupé and we’d shovel the scree (loose cement and rock fragments) into it. After a couple of weeks of this, Katie decided she was more of a home-body than a labourer, so we got into a delightful routine. Every morning at 8:30, Matt and I would set off for La Otra Casa for swinging, picking and chucking. At 11:00, we’d take a break – always at El Patio – coffee, brandy and toast for me; ham, cheese and iced tea for Matt (I bet that Pepe the owner still remembers). At 11:30, we’d go back and shovel the morning’s work into the dupé. At 1:30, we stopped for the day, going back to Casa Alta for lunch – which had been prepared by Katie … who had also cleaned the house, done the laundry and made the beds. Every afternoon, we went off to the delightful swimming pool at Jimera de Libar, where we lay in the water, surrounded by mountains and olive groves, and looked at a clear blue sky. So, after six months in the village, did I return to South Africa in mid-August looking really fit and tanned, with a body and muscles like Demi Moore’s? Er, no, not really. Although I had been there since the end of February, we didn’t start knocking down the house until mid-May, and I realised I’d spent the first 10 weeks eating, drinking, entertaining and socialising … and had gained exactly a pound a week during that time. However, I had accomplished my main goal; by the end of July (and 63 dupé loads later), only the original cottage was still standing, and we had to get Rafael the architect to come back and re-measure. The plot looked to be quite a bit bigger than it had first seemed.